Has anything changed in the last decade to curb huge and lethal borrowing short-term and investing in long-term bets? The total debt of U.S. sectors—consumers, nonfinancial business, financial institutions, state and local governments, the federal government and the foreign sector—now totals 3.5 times GDP. 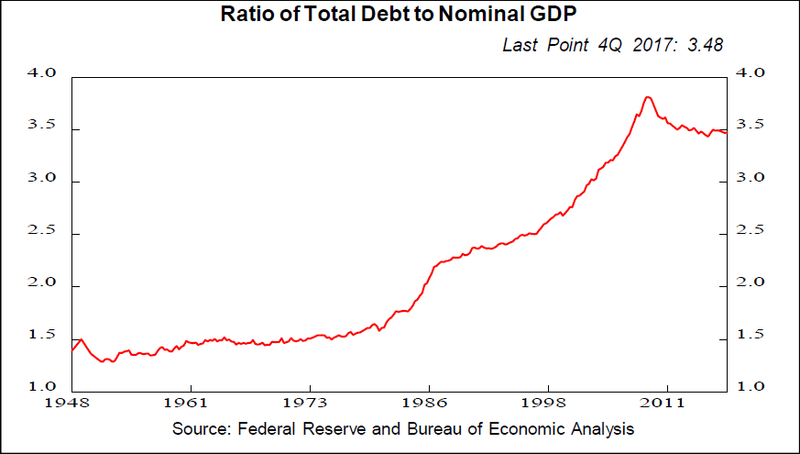 So it now takes $3.5 of debt for every $1 of GDP, up 2.3 times from the 1.5 ratio of the 1960s and early 1970s. That ratio is down somewhat from the 3.8 peak in April 2009, but obviously still very high by historical standards. Debt, along with equity financing, is the grease that keeps the gears of the economy running smoothly. It’s what turns a primitive barter economy into a sophisticated, efficient structure. It’s probably true that as economic complexity grows, more financing per dollar of GDP is needed. But is the 200% leap from $1.68 in the 1960-1980 years to $3.5 in the third quarter of last year justified? 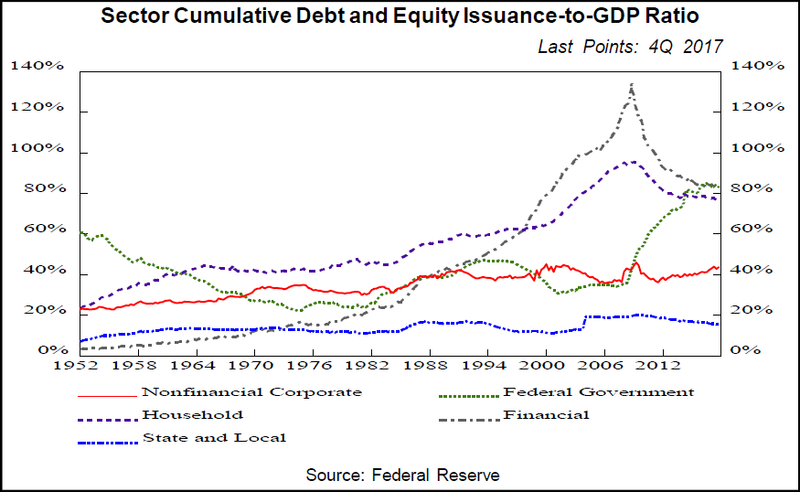 Debt of the financial sector in relation to GDP has declined considerably due to government regulations, especially the 2010 Dodd-Frank law enacted after the federal government was forced to bail out financial institutions during the financial crisis. Banks were required to hold more capital to absorb losses and more reserves of cash and liquid assets in addition to having limits placed on proprietary trading and incentives for risk-taking. Last November, a U.S. Senator asked now-Fed Chairman Jerome Powell if big banks are still “too big to fail.” “I would say, no,” Powell answered. The Trump Administration has dialed back some of the bank regulations, but the chances of another 2008 financial crisis are probably remote. If history is any guide, the next financial trauma will appear elsewhere just as the savings-and-loan crisis of the late 1980s was not repeated but followed by the dot com stock bubble collapse of the early 2000s. Then came the rise and fall of subprime mortgages. The Dodd-Frank restrictions are to some extent probably fighting the last war. In this light, it’s interesting to note that finance is moving out of the large banks to less-regulated lenders such as bond investors. Furthermore, private equity firms are lending to finance their own deals as low interest rates and investor zeal for yield have made these higher risks attractive. 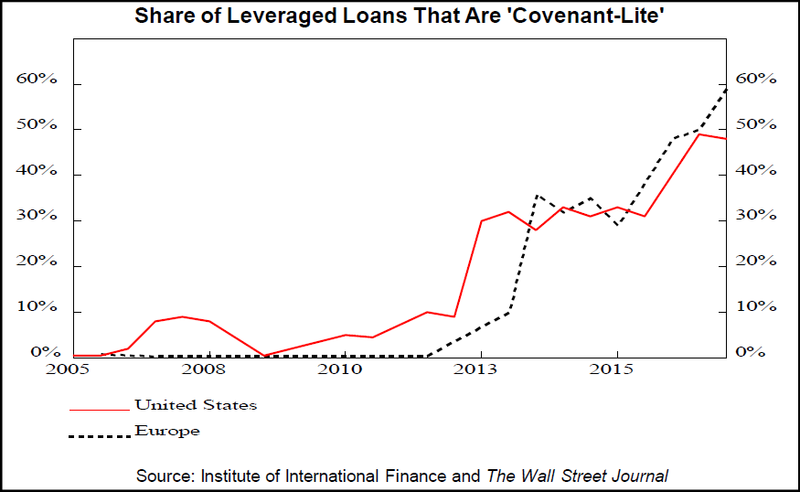 Leveraged loans, low-quality vehicles used to finance corporate takeovers, hit a new high of $1.6 trillion last year and investors are increasingly willing to buy “covenant-lite” loans with few caveats to prevent egregious behavior by borrowers. To read the rest of Gary Shilling's April INSIGHT newsletter, click here for subscription information. Each issue includes an extensive overview of the economy, exhaustive investigations of key economic indicators and how they affect your investment portfolio, detailed examinations of emerging business and financial trends that could spell opportunity or danger to you and your investments, our investment themes, a wrap-up of recent economic data, and Gary Shilling’s back-page Commentary on matters great and small. You can also follow Gary on Twitter @agaryshilling.